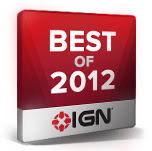 MASKS AND MOBSTERS is up for IGN's best of 2012 Digital Comic Award. Please take the time to vote. You don't have to register or sign up for anything just click on Masks and Mobsters and hit vote. Monday December 17th is the last day to vote! In a lot of ways we are the underdog here. Up against Batman and Superman. Don't get me wrong... I love those guys but I'd like a fighting chance. Those books have a marketing team behind them, we just me, Mike, and Allison at Monkeybrain. It's a constant struggle to launch anything new, so please give us a vote. Masks and Mobsters 3 and 4!